As a Photographer, Cinematographer, Producer and Director, Lynn Spinnato has been behind the camera, professionally, for more than thirty years. She spent the early years in advertising and the music industry, and In 2003 she opened Spinnato Gallery on Long Island, NY. 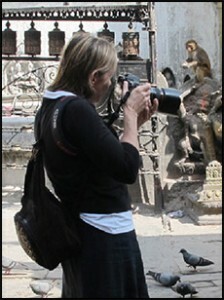 Today, she photographs for corporate and private commissions and fine art gallery exhibitions. Her images have appeared in magazines, books and CD covers and her fine art prints are included in private, corporate and public art collections. She also continues to direct, write and produce documentary short films . Spinnato’s career started in 1982, when, after studying photography at School of Visual Arts, she was hired full time by her professor to assist in a Manhattan photography studio. This launched Spinnato in to the corporate art world of Advertising Photography. As a young studio photographer, Spinnato assisted and shot for fashion and corporate clients, including Revlon, American Express, and opera singer, Placido Domingo. 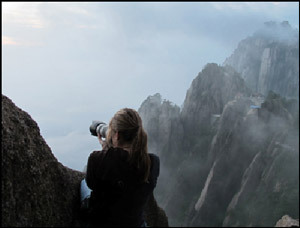 Within a year, her photography experience opened the door to a staff position in the television production department at the 2nd largest international advertising agency at the time, Young & Rubicam. During her 5 years on Madison Avenue, she produced commercials for a client list which included Jell-O with actor/ comedian Bill Cosby, New York Telephone, Johnson & Johnson, Breyers Ice cream and Colgate-Palmolive. In addition to Music Videos, Spinnato wrote and directed interviews and short biographies for Atlantic, ultimately receiving recognition and awards for her moving images from Billboard Magazine, MTV, and VH-1. Her photographs appeared on CD covers and posters for bands like The Stone Temple Pilots and organizations like The United Way. In 1995, on a cold winter day, while filming in an abandoned theater in Columbus, Ohio, Spinnato had a surprising epiphany as she worked with her all-time musical idol, Robert Plant, of Led Zeppelin … she was tired of producing. Two months later, she left Atlantic Records to concentrate on directing, represented by Pecos Films out of Nashville. During the late ’90’s, while directing and writing, she found her way back to her original passion, still photography, and back to New York. Lynn Spinnato credits the spiritual nature in her most recent work to her repeated travel outside the U.S. During her many visits to China, she was powerfully drawn to it’s landscape. At first, seemingly quiet and still, she found it, in fact, ever moving with great energy. Brush paintings came alive for her there, and her own atmospheric imagery found deeper roots during those journeys.